You have wandered into Zipgolfer.com’s VIP room, and this driver that you are gawking at is the Rolls Royce of drivers. This is one of the priciest drivers you have ever seen, handmade by people that you have never heard of. However, this MG710 is cheap compared to some of the woods and irons they make that are constructed with platinum and gold. Honma, a Japanese company that has been around forever and previously solicited by mainly wealthy Japanese folks and celebrities, has started to get a lot of attention with the introduction of their Beres stock. This line contains less flair and more focus on performance. 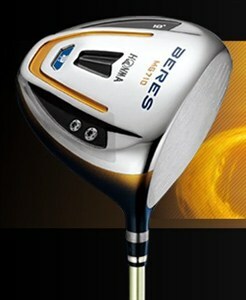 This Homna MG710 driver is designed for amateurs with average swing speeds (88mph to 105mph.) The huge 460cc contains bazooka ribs and a shallow, wide head. The MOI is completely maxed out on this marvel of performance. This driver will certainly be a conversation piece, not only for its uniqueness but also because of the huge drives you will be ripping. Golftoimpress.com did a performance test and the MG710 tied for first place for Best Max Distance.